He was born in Natal in 1920, and although his family was poor he managed to complete high school. He worked as a truck driver, a union organiser for sugar workers, and for some time in the 1950s was Durban branch editor-manager of the left-wing newspaper New Age. 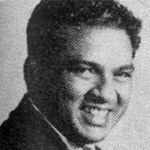 In the 1940s he was one of those responsible for bringing militant leadership into control in the South African Indian Congress and was Vice-President of the Natal Indian Congress (NIC) from 1945 until 1952, when he was ordered to resign from all political and other organisations. In the meantime, he had served as secretary of the council that organised the 1946 Passive Resistance Campaign, he was imprisoned twice during that campaign. In 1952 he was joint secretary with M. B. Yengwa in the Defiance Campaign of the ANC (Natal) and again (although acting illegally since he was under ban) joint secretary of the Congress of the People campaign in Natal in 1954-1955. He was one of the 156 Congress leaders charged with treason in 1956, but charges were dropped against him in the late 1958. He was detained during the 1960 emergency and again in 1963, when he was placed in 90-day detention, but no charges were brought against him. He later left South Africa and was active in the Congress movement in exile, serving as an editor of Sechaba and as the ANC's London publicity and information director. Born into an Indian working class family in the harsh conditions of the 1920s, he was forced to leave school at an early age. He worked in a factory, he drove a baker's van - and he quickly learned the nature of national and class oppression. From the age of 18 his entire life, for the next forty years, was to be spent in the service of the people, without regard to personal sacrifice. M. P. was responsible, together with his comrades, particularly George Ponen and the late H. A. Naidoo, in organising the Indian workers into trade unions and leading them into militant strikes. At the same time he worked assiduously to bring about cooperation and unity all black workers. He was elected Secretary of the Natal Sugar Workers union and energetically plunged into the difficult task of contacting the workers in the sugar fields. M. P. was a key figure in the Anti-Segregation Council of the Natal Indian Congress, and he helped to transform the Congress into a mass organisation with a militant policy of struggle and of unity of action of all the black people. In the 1946 Indian passive Resistance Campaign M. P. distinguished himself as an able and first class organiser. He was appointed Secretary of the passive resistance Council and subsequently became Secretary of the natal Indian Congress. M. P.'s immense contributors and leading role in the major campaigns and trials of the 1950s and 19060s are too numerous to list here. During his long political career he was arrested countless times, and during the 1906s he was detained under the 90-day and 180-day laws. In exile from 1965, he threw himself unflinchingly into the work of the External Mission of the African national Congress. As Director of Publicity and Editor of Sechaba, he fulfilled his duties with distinction. For M. P., his work as trade unionist, Congressman, politician and journalist were not different occupations. Journalism, for example, was simply another front on which to fight the enemy. When he was editor/manager of the New Age office in Durban it became a recruiting ground and a battlefield, with people from all walks of life and from all over the country pouring into the office. The special triumphs of his political career flowed directly from his political contacts. For instance his exposure of the kidnapping of Anderson Ganyile in Basutoland was possible because the note smuggled out by Ganyile was taken to him. The expose was responsible for the outcry that led to Ganyile's release. Similarly, during the Pondoland campaign of the 1960s, the people involved sought out M. P. and the New Age office to tell their story, and it was his pioneering work in building up contacts that stirred the publicity which was given to the campaign. In 1961 he was awarded the International Organisation of Journalists' gold pin, for his contribution to journalism at home and abroad; and Sechaba was awarded the IOJ gold medal. At the Eighth Congress of the IOJ at Helsinki last September, M. P. was awarded the prestigious Julius Fucik medal, and he was elected to the Executive of the IOJ. He accepted all these honours not as personal tribute, but as a tribute to the work of the ANC and the Congress Movement as a whole. M. P. was a man who did not tolerate snobs, snobbery and affectation. He was always direct, straightforward and hard-hitting. Above all, he had an endless love of life, which has now been extinguished. But his example will continue to inspire. His comrades have taken up the pen and the sword the he dropped, and are carrying on the fight to achieve the new South Africa for which he fought so long, side by side with all of us. Leaders and militants, friends and family came together from all parts of the world at the Golders Green Crematorium in London on May 8 to say a last farewell to Comrade M. P. Naicker, Director of Publicity of the ANC External Mission, who died on April 29, at the age of 56. The crowd, which overflowed from the building into the courtyard, heard tributes from the Acting President of the ANC, Oliver Tambo, the Chairman of the South African Communist Party, Dr Yusuf Dadoo, and Comrade Brian Bunting. The ANC choir sang the national anthem, Nkosi Sikelel'i Afrika, over M. P.'s flag-draped coffin. "M. P. was snatched from us brutally and suddenly. Our hearts go out to the members of his family, the Naicker's, who stood by his side during all his sufferings and his joys, and supported him in his efforts to achieve the South Africa that he was working for. M. P. was a warm and loving person who belonged to all of us. If he were able to look back on his life he would have little cause to regret. From his early teens he made up his mind that there was only one course for him to follow - to serve the cause of his people for liberation. In the face of every obstacle and discouragement, he never shifted from that path, and he died still fighting for the South Africa that we all believe in, as outlined in the Freedom Charter".